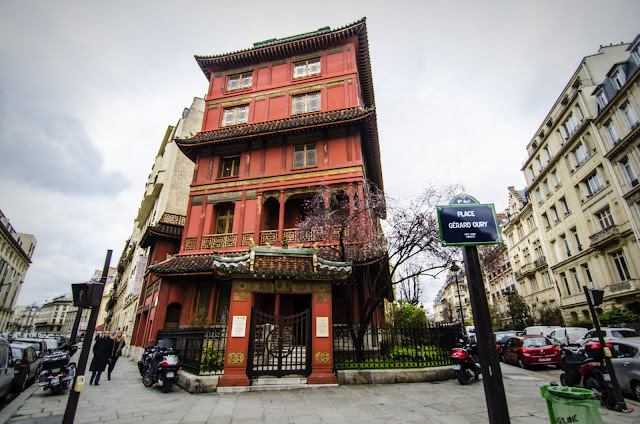 After the "forest" house I found in the 20th arrondissement, here is another odd looking building that can be found at the corner of rue de Courcelles and rue Rembrandt, a pretty chic neighborhood where you find more high-end Haussmannian buildings than... Pagodas! For yes, lady and gentlemen, this is a real Chinese Pagoda, built by a rich Chinese art dealer (Ching-Tsai Loo) in the 1930's (I've been unable to find the exact date). The place is still an art gallery nowadays, it has been recently renovated and can also be used for private parties. But it cannot really be visited, like a museum or a monument. Too bad, for the inside really looks interesting! Check for yourself on their website. Fascinating building and history. It does seem odd in Paris. Well this is indeed an amazing coincidence. Last night I was catching up on my recordings of France 3's "Des racinces et des ailes" program and during the 5 December 2012 show, there was a segment on this house. They interviewed the grandson of the art dealer who renovated this house into a pagoda. He apparently lived there (the grandson) until a few years ago when it was decided to convert it to its current function. Of course they had some really nice shots of the interior and it is indeed incredible. One of the main rooms used for displaying art works has completely lacquered walls in brilliant colors and Chinese designs. If you ever get an invitation to this place, Eric, sneak me in with you ! I saw it in January in Montreal but can't access the video. "Autre quartier, autre époque : la Plaine Monceau. A la fin du XIXe siècle, les frères Pereire font édifier de nombreux hôtels particuliers autour de l'ancienne "Folie de Chartres" : un lieu de plaisir dédié aux fêtes et aux spectacles, devenu en 1861 le parc Monceau. Les caméras de l'émission sont installées dans l'hôtel particulier le plus étonnant du quartier : la Pagode. En 1925, M. Loo, un marchand d'art asiatique, décide de transformer cet hôtel de style Louis-Philippe en une incroyable maison chinoise, au cœur du Paris haussmannien !" Thank you The Beaver. I'm really cross I missed this exhibition last December. And I'm going to try to borrow the show from Stuart. I'm sitting here on the north shore of Long Island and it just began to snow so I'm feasting my eyes on this photo -- are those CHERRY BLOSSOMS on that tree?? I usually love seeing the cloudy grey skies of Paris but today I love the tiny pink flowers. I will have to check my Silent Traveller in Paris. You would think that Chiang Lee would have known of Mr. Loo -- I'm going to re-read the book this weekend (it also contains a wonderful chapter about a night out on the town and going out for an early morning breakfast at Les Halles -- I wish I'd been alive in the 1940s). Who is Chiang Lee? The Silent Traveller? Chaing Lee was a Chinese traveler who wrote a series of books about his voyages in the western world from the 1920s to the 1950s. He is the only person who does what I do: he writes illustrated travel memoir, but his books are more delicate and more sophisticated and he traveled in a wondrous age when it was outré to be a vagabond. Maybe his books are only in English. The website is very nice. Mai,combien coute? I wish we could afford it for, say, a party on 5 mai. C'est la vie. Alexa: according to Google Map, Place du Perou is where avenue de Messine meets boulevard Haussmann. The most valuable service station in Paris! The little Munchkins of Agnès Baillon! The two week Eclair feast!